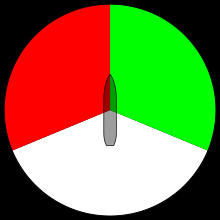 Schematic view of a ship's navigation lights indicating its port (red) and starboard (green) sides. To understand which is which, when a person is on board and facing the bow on a vessel or aircraft, that is, facing forward towards the direction the vehicle is heading when underway, the port side is the left-hand side and the starboard side is the right-hand side. However, port and starboard never change; they are unambiguous references that are not based on the relative directions of an observer, just as the cardinal directions of east and west do not change no matter the direction a person faces. The term starboard derives from the Old English steorbord, meaning the side on which the ship is steered. Before ships had rudders on their centrelines, they were steered with a steering oar at the stern of the ship on the right hand side of the ship, because more people are right-handed. Since the steering oar was on the right side of the boat, it would tie up at the wharf on the other side. Hence the left side was called port. The Oxford English Dictionary cites port in this usage since 1543. Formerly, larboard was often used instead of port. This is from Middle English ladebord and the term lade is related to the modern load. Larboard sounds similar to starboard and in 1844 the Royal Navy ordered that port be used instead. The United States Navy followed suit in 1846. Larboard continued to be used well into the 1850s by whalers. 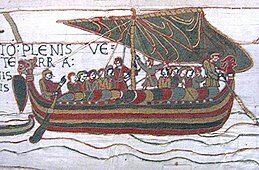 An Anglo-Saxon record of a voyage by Ohthere of Hålogaland used the word "bæcbord" ("back-board") for the left side of a ship. 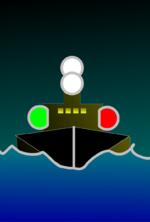 The navigational treaty convention, the International Regulations for Preventing Collisions at Sea—for instance, as appears in the UK's Merchant Shipping (Distress Signals and Prevention of Collisions) Regulations 1996 (and comparable US documents from the US Coast Guard)—sets forth requirements for maritime vessels to avoid collisions, whether by sail or powered, and whether a vessel is overtaking, approaching head-on, or crossing. :11-12 To set forth these navigational rules, the terms starboard and port are absolutely essential, and to aid in in situ decision-making, the two sides of each vessel are marked, dusk to dawn, by navigation lights, the vessel's starboard side by green and its port side by red. :15 Aircraft are lit in the same way. Look up bæcbord, larboard, starboard, or port in Wiktionary, the free dictionary. ^ a b NOS Staff (December 8, 2014). "Why Do Ships use "Port" and "Starboard" Instead of "Left" and "Right?"". NOAA National Ocean Service (NOS) Ocean Facts. Washington, DC: U.S. Department of Commerce, National Oceanic and Atmospheric Administration (NOAA). Retrieved February 2, 2017 – via OceanService.NOAA.gov. ^ a b RMG Staff (February 2, 2017). 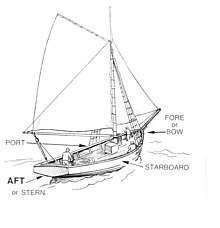 "Port and Starboard: Why do Sailors say 'Port' and 'Starboard', for "Left" and "Right?"". Discover: Explore by Theme. Greenwich, England, UK: Royal Museums Greenwich. Retrieved February 2, 2017 – via RMG.co.uk. ^ Grape, Wolfgang (1994). The Bayeux Tapestry: Monument to a Norman Triumph. Art and Design Series. Munich, DEU: Prestel. p. 95. ISBN 978-3791313658. Retrieved February 2, 2017. ^ Administration, US Department of Commerce, National Oceanic and Atmospheric. "Unlike left and right, port and starboard refer to fixed locations on a vessel". oceanservice.noaa.gov. Retrieved 2017-10-12. ^ Norie, John William; Hobbs, J. S. (1847) . Sailing directions for the Bay of Biscay, including the coasts of France and Spain, from Ushant to Cape Finisterre ("A new ed., rev. and considerably improved" ed.). C. Wilson. p. 1. OCLC 41208722. Retrieved 7 February 2010. An order, recently issued by the Lords Commissioners of the Admiralty, states, that in order to prevent mistakes, which frequently occur from the similarity of the words starboard and larboard, in future, the word port is to be substituted for larboard, in all Her Majesty's ships or vessels. ^ George Bancroft (February 18, 1846). "Port and Starboard: General Order, 18 February 1846". General Orders. Washington, DC: US Navy, Naval History and Heritage Command (NHHC). Retrieved February 2, 2017 – via History.Navy.mil. ^ a b c MCA Staff (2004) . The Merchant Shipping (Distress Signals and Prevention of Collisions) Regulations 1996 (PDF). Southampton, ENG: Crown Department of Transport, Maritime and Coastguard Agency (MCA). Retrieved 2 February 2017.